This little case makes a great pocket companion while you’re on the go. Features Phone Stand, Headphone Splitter, Pen with Stylus, Earbud and Case. 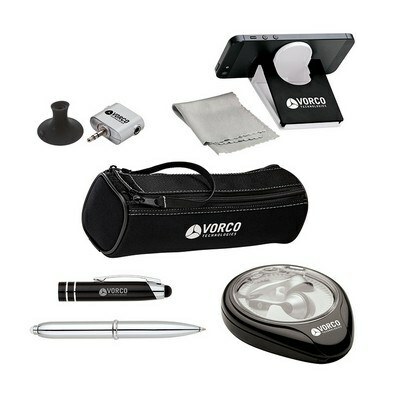 This Whizzie™ SpotterTie™ Set includes earbud headphones, headphone splitter, a mobile phone/tablet stand and a stylus pen in a soft neoprene zippered travel case. This little case makes a great pocket companion while you’re on the go. You can easily insert your brand details to create customized giveaways for promotional events.